This is a great, classy spot located in the Virginia Highlands neighborhood. I highly recommend the eggs Virginia Highland or the burger, but you can't go wrong with any of their items. I went here last year for Easter Brunch. The food was great and the atmosphere on the patio was perfect for sunny days. I recommend the ESS benedict and the fried chicken biscuit. This is one of my favorite brunch spots. The interior is very unique and the food is amazing. I recommend the shrimp and grits, chicken benedict, corned beef hash and the chicken and waffles. It is southern food, so don't expect anything super healthy. This spot is also in the Dining Out Passbook. You can get BOGO entrees! Grab your book here and use code NOP18 to get it for $39 + free shipping. Another one of my favorite brunch spots. Buttermilk Kitchen always has a long wait, so go in knowing that. I promise it is worth it! I recommend the buttermilk pancakes, fried chicken and waffles, pimento omelet, chicken biscuit and of course their biscuits. I went here this past weekend and really enjoyed it. The food was good and the interiors made it feel like I was back in Paris. I recommend the pancakes and the scrambled eggs and trout. I haven't tried this place yet, but this is where I will be brunching this Easter Sunday. 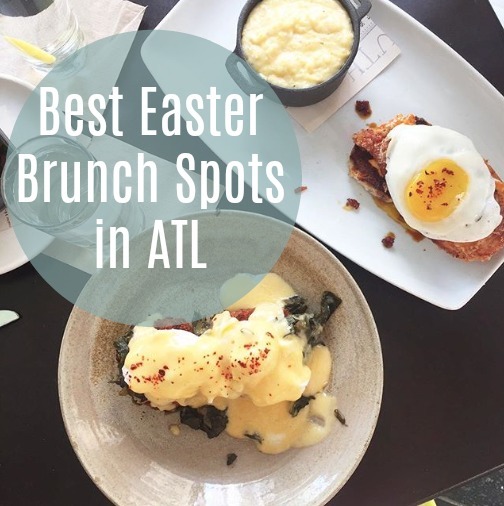 They were named one of the hottest brunch spots in ATL by Eater back in December. Another one of my tried and true brunch spots. This place is adorable inside and they have a patio for warmer days. Some of my favorite dishes from here are the pimento cheese omelet, scrambled egg pressed panini, P.B.L.T and the belly benedict. This place is an Atlanta brunch staple. They have multiple locations, but my favorite is the Old Fourth Ward location. Some of my top pics from here are sweet potato pancakes, crab cake benedict, ham and cheese sandwich and the pimento cheese sandwich.